One of the driver training courses on offer at RSM is the Ambulance Driver Training Course which provides candidates with the training and skills required to drive an ambulance for the NHS. It is of course a vital part of the health service’s care and we are proud to be a training provider for the NHS. We recently caught-up with one of our newly trained and qualified ambulance drivers, Jeremy Jennings, who now drives an ambulance for the East Of England Ambulance Service. 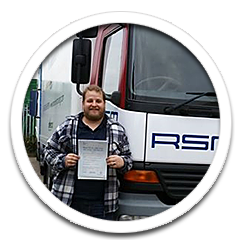 Jeremy was our first trainee driver from the EEAS and he passed the driving test the first time. Thank you to all staff at RSM commercial driver training, in particular my instructor for the week Geoff. It has been a great experience doing this driving course. I also felt it helped with bad habits that I have gathered over the years! Everyone has been friendly yet professional and extremely helpful, the brand new training vehicle is lovely to drive and will benefit ambulance staff members for many courses to come. It was evident that Jeremy is enjoying his work as an ambulance driver and we wish him the very best of luck in both his driving and his career. Are you interested in becoming an ambulance driver? RSM are the chosen driver training provider for the East Of England Ambulance Service. We offer intensive 1-to-1 ambulance driver training courses in a modern equivalent of today’s ambulances with training courses designed to provide high quality personalised training, so that our candidates are confident and capable drivers. Read more about our Ambulance Driver Training Course here. If you would like more information please contact our customer service team.